At 2.5 billion years old and weighing in at 2.5 tonnes, the banded iron formation is so heavy that Museum engineers had to reinforce the floor underneath it in Hintze Hall. 'The rock tells a fascinating story,' says Prof Richard Herrington, Head of Earth Sciences at the Museum. How did the banded iron form? More than three billion years ago, bacteria in Earth's young ocean started to produce oxygen through photosynthesis. Around 2.6 billion years ago, bacteria really started to bloom and oxygen levels followed suit. This oxygen combined with dissolved iron in the sea to form insoluble iron oxide, which sank to the sea floor. As it settled, sheets of red iron oxide were laid down between layers of silica-rich silt. Over hundreds of millions of years, the oxygen bound with all the soluble iron that was available in the waters. The remaining free oxygen had nowhere else to go but up and out into the atmosphere. The intricate layers in the formation represent a turning point in Earth's history known as the Great Oxygenation Event. From this start, a further two billion years of oxygenation enabled a rapid increase in the formation of both minerals and new forms of life. Richard says, 'The Oxygenation Event is the prelude to complex life. We're oxygen breathers and all organisms need an energy source. The burning of carbon in the presence of oxygen is largely where we get our energy from. The waves of colourful rock within the specimen are made up of black and red bands of iron oxide (mostly haematite and some magnetite), interspersed with lighter sedimentary rock (silica). Scientists think that the layers and colour variations may mark cycles of bacterial boom and bust during the oxygenation events. The bacteria responsible for producing oxygen are called cyanobacteria or Cyanophyta, which obtain their energy through photosynthesis. The Great Oxygenation Event happened globally, so banded iron formations can be found on every continent. They allow scientists to research the early atmosphere of our planet and the process of rock formation. 'Banded iron formations are also an important commodity, and their iron content has been drawn on to build the world as we know it,' Richard says. Today, most of the iron from these rocks is used to make steel which is needed to produce cars, ships, buildings, bicycles and countless household items. The specimen that visitors can see in Hintze Hall comes from the Pilbara region in northwestern Australia. The mining company Rio Tinto identified a 12-tonne lump of iron formation at one of its open-cast mines and had it cut down, polished and shipped to the Museum. Containing approximately 32% iron, the formation didn't qualify as an ore-grade material, which would have made it useful to the company. Ore-grade materials require 58-62% iron content. 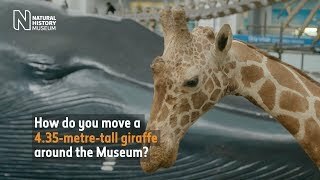 Part of the decision to include a number of star specimens in the newly revamped Hintze Hall is to highlight issues of sustainability - to get us all to think a little deeper about how we use Earth's resources. 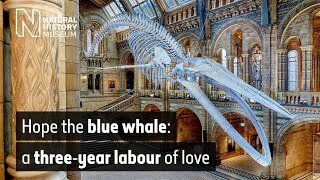 Visit the Museum to explore new specimens and walk beneath the blue whale, the largest animal ever to have lived.